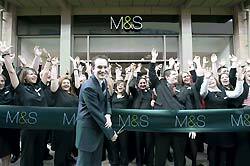 Marks & Spencer yesterday opened a brand-new full offer store at Witney’s Marriotts Walk development. The new 25,300 sq ft store has created 118 jobs. Store Manager, Chris Taylor and his new team unveiled the store with a ribbon cut before inviting customers through the doors to continue celebrations with a complimentary glass of champagne and in-store entertainment including tips from fashion stylists and cooking demonstrations from an M&S chef. The brand-new M&S gives local consumers a great destination for their Christmas shopping, offering a wide selection of fashion across womenswear, including per una and Portfolio, as well as menswear, kidswear, lingerie and accessories. In addition, a home department offers a stylish range of homeware from kitchen essentials to a selection of bedroom and bathroom accessories. The Food Hall offers quality product ranges as well as an in-store bakery with freshly baked breads and pastries and a food-ordering service provides convenience and flexibility, allowing customers to order festive food in advance. The store also benefits from a 52-seater M&S Café, offering a wide variety of hot and cold refreshments, including Fairtrade tea and coffee served by specially trained baristas. Sandwiches, home-made baguettes, toasted ciabattas, pastries and cakes are also available. The store features Marks & Spencer’s signature style with bright, contemporary interior design and incorporates a number of initiatives in line with Plan A, M&S’ 100-point ‘eco’ plan. Water saving features such as dual flush toilets and self-closing taps have been fitted in the staff and customer facilities, whilst lighting with movement sensors helps to save energy. In addition, solar roof panels provide all hot water for the store and 80% of all construction waste materials have been recycled.